@olivierbusquet sweeps @tonkaaaap heads up to replace @phil_hellmuth as King of the Hill champion. The finals of King of the Hill 2 took place at Rivers Casino in Pittsburgh, Penn., as Olivier Busquet and Parker “TonkaaaaP” Talbot squared off in the finals after winning their first-round matches against Shaun Deeb and defending champ Phil Hellmuth, respectively. 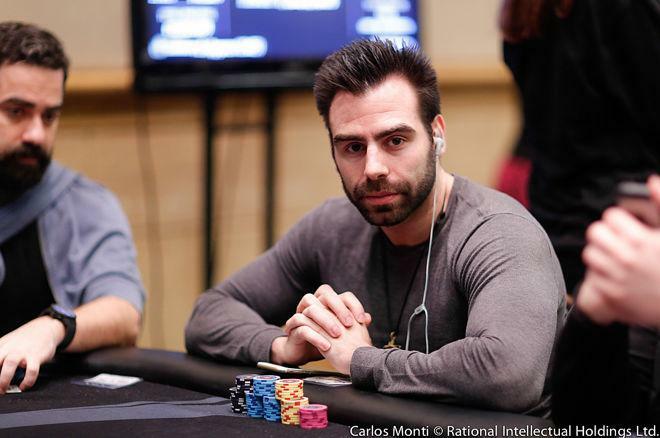 Ultimately, Busquet won the second edition of Poker Night in America’s heads-up competition after sweeping both Deeb and Talbot in two matches each. In the finals against Talbot, the two started with $100,000 in casino chips and played heads up in a tournament format. While the structure called for a best-of-three series, Busquet closed it out in just two to take down the $200,000 purse along with the championship belt and it was all captured on the Poker Night in America Twitch channel. In the first heads-up, Talbot got off to a good start, taking an early marginal lead against Busquet and continuing to grow that lead after taking down a couple of pots preflop with queens back-to-back. After that, the two traded small leads multiple times and while Busquet held a lead at blinds of 1,200/2,400, he raised to 6,000 with and Talbot three-bet to 18,000 with . Busquet called and the pot was quickly ballooning. The flop gave Busquet trips and Talbot led out for 10,000. Busquet called and the turn was the , giving Talbot a gut-shot straight draw that would be no good if he hit as a nine would also make Busquet a full house. Nevertheless, Talbot bet 17,000 on the turn. “I gotta say, it kinda looks like he’s getting ready to unload the clip,” said Doug Polk in the booth, where he sat with Hellmuth. Busquet once again flat-called and Polk’s intuition proved true. The river was the and Talbot emptied the clip, moving all in. Busquet quickly called to bring the first match to an end with his trip tens. In the post-game interview with Pete Manzinelli, Busquet attributed his match wins thus far to both skill and luck. “Honestly, I ran good yesterday and I ran good again today," he said. "I had said before the last hand that I hadn’t called a single three-bet, so that was the first three-bet I called, and I just flopped trips. And then I get a turn card for him to barrel, so I mean that’s really fortunate. And obviously, I think I’m playing pretty well but I’m running really well, so I’m hoping that it continues. Talbot gave his opponent credit. He’s pretty good at the game, ya know?” he said, joking to Manzinelli that, “I just have to get good cards, that’s it." In the second match, Busquet took first blood, and a few hands into the match an interesting one developed. With blinds at 500/1,000, Busquet raised to 2,500 on the button with and Talbot called with . They saw a flop of , giving both players an open-ended straight draw and also top pair for Busquet and a flush draw for Talbot. Talbot check-called another 2,500 from Busquet and the turn brought the , an interesting card indeed. It gave both players the same straight, with both also free-rolling with flush draws. At this point, Talbot led 5,500 and Busquet called. The river completed the flush for Talbot and he led for 17,000 this time. Busquet considered it for quite some time but eventually sent his cards to the muck and used a reveal to confirm his good read on the river and they were back to even. Busquet then carried out a couple of successful bluffs to put him in the lead. The two stayed rather close in chips for some time with Talbot closing in to even out the stacks a few levels later. Busquet was still ahead when Talbot raised to 5,500 on the button with and Busquet three-bet to 17,000 with in the big blind. Talbot called and the flop favored Talbot who made aces up. Busquet checked, Talbot bet 10,500 and Busquet called. Both players checked the turn and the river gave Talbot aces full. Busquet checked and Talbot fired 30,000 which Busquet called "unfortunate" before giving it some thought and sending his fishhooks to the muck. A bit later with blinds at 1,500/3,000, Talbot was still in the lead and they played a big one. Busquet raised it up to 6,000 on the button with and Talbot defended his big blind with . Both players made a pair on the flop, but Talbot’s was best. Both players checked flop and saw the turn. At this point, Talbot bet 9,000 and Busquet called. The river gave Busquet trip sixes. “Now the question is how expensive is this gonna be,” Polk observed. It turned out to be extremely expensive for Talbot as he opted to lead for 12,500 and call when Busquet went all in for 72,500 total. Busquet sprung into a massive 7-1 chip lead with that pot and a short while later, it was over. After the match, Manzinelli asked Busquet how he managed to sweep both rounds. "It was four matches. I played two good players; especially Parker played well. I just got the better end of the deck in every single game." Talbot credited Busquet's strong folds, though. "Um, no," he said when asked if the deck had favored his opponent. "He folded like every time I had like a big hand. It was... annoying." Busquet laughed but explained that he was also fortunate to have the board run out in certain ways that made it easier to fold when his opponent did have him beat. "You can get lucky to make good folds at the same time as making good hands." Talbot expressed on Twitter disappointment as well as an appreciation for the chance to compete for the KOTH title. It has been announced on the Poker Night in America stream that King of the Hill 3 is scheduled to take place later this month on Oct. 25 and 26 at Sugarhouse Casino in Philadelphia. Busquet will defend his title against three new contenders: 2017 WSOP Main Event champion Scott Blumstein, Dan Coleman and Brandon Adams. PokerNews will continue to bring the latest on upcoming King of the Hill action, so be sure to check back for updates.